Did you know that Spain is one of the most visited touristic destinations in the world? Every year this beautiful country welcomes 60 million tourists. This has made tourism and import source of income. Spain has the reputation of being a mass destination for a beach holiday with exciting night life, but the country has much more to offer. You can find many glorious forests and a rough coastline, stretched out highlands and snow covered mountains. The historic cities board a treasure of culture and atmosphere. Admire the work of artists, like Picasso, Dalí and Gaudí and wander around in worldly Barcelona, royal Madrid and century old Sevilla. In picturesque villages you can get a taste of real Spanish life away from all the tourists. Besides that, you can ware yourself out with many (water)sport and adventurous activities. And of course you can enjoy wonderful regional dishes, the tapas and the mild climate. The summers are warm and even in the winter the temperature is pleasant. Spain isn’t popular with winter visitors for no reason. On average Spain has approximately 315 sunny days per year. Spain is an ideal destination for any type of trip, let yourself be surprised! Find your dream villa in Spain here! Gaudí´s life project in Barcelona. In the crypt his remains are kept in the Carmen Chapel. Madrid and Barcelona are the most well known cities. Barcelona is a modern city when you look both at the architecture as the shops. A lot of work was done on the city in the months living up to the Olympic Games in 1992, but the old centre has luckily not disappeared. In the Barri Gòtic, Barcelona's oldest neighborhood, you can feel the heart of the city beating. The Ramblas harbours many tourists, but you cannot miss out on it of course. To see and be seen is what it is all about. You can visit one of the many interesting museums, admire the building sites of Gaudí, feel the enormousness of the soccer temple Camp Nou, do some extensive shopping and you can go out in one of the many trendy clubs. It is a wonderful city. The capital Madrid, the home of the Royal family, has a more classic nature. But also here you will have a wonderful time. Visit the Royal palace and the famous Prado museum, catch your breath in the lovely green Retiro Park and taste the night life in the neighborhoods of La Latina and Malasana. Soccer loves can of course visit the Bernabeu stadium of Real Madrid. Other cities that are definitely worth visiting are Seville, Granada and Cordoba, located in Andalusia in the south of Spain. A round trip through this region is the ideal way to enjoy everything it has to offer. You will be overwhelmed by the art treasures, like the Alhambra in Granada and the cathedral in Seville, but you can also be impressed with the route through Sierre Nevada with her snow covered mountain tops. You can also visit the beautiful villages in the hinterland of Malaga and unwind at the wonderful Costa del Sol on the south coast with her mundane seaside resorts Marbella, Puerto Banus and also the well known Torremolinos. Another well known coastal region is the Costa Blanca on the east coast with Alicante and Benidorm as popular seaside resorts. A little more north on the Mediterranean Sea you can find the Costa Brava, a destination that is very accessible from a lot of countries. These are ideal places for a relaxed holiday, like Lloret de Mar where you can enjoy the sun, sea and beach, water sport lovers can also enjoy themselves until their hearts ´content. From the Costa Brava you can also easily make a trip to Barcelona. The most northen coast of Southern Catalonia is la Costa Dorada, with a privilegied location that allows it to have a very diverse terrain ranging from the mountains to the coast. The Costa Dorada is endowed with golden beaches, which is why people call it the Spanish Golden Coast. The perfect spot for surfers is on the coast on the west side of Gibraltar, the Costa de la Luz. The island groups the Balearen and the Canary Islands are also very much worth the visit. The most well known islands of the Balearen are Ibiza, Mallorca and Menorca. They lie on the east side of the main land in the Mediterranean Sea, between Spain and Italy, and are known for their fantastic climate, beautiful white beaches and nature en the many night life possibilities. Also golf lovers can entertain themselves on the island, Mallorca on its own already has 18 golf courses! Especially Ibiza is a real party island, the biggest island Mallorca offers with its capital Palma de Mallorca also a lot of culture. 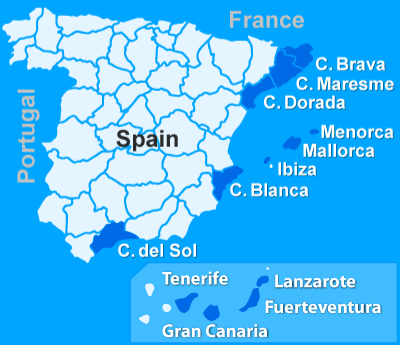 The Canary Islands are a bit more southern, on the west side of Morocco in the Atlantic Ocean. The island group counts 7 big islands (Gran Canaria, Tenerife, La Palma, Lanzerote, Fuerteventura, La Gomera and El Hierro) and a few small islands. They are volcanic islands, on Tenerife lies the sleeping volcano Teide, the highest top of Spain. Water sport lovers and sun worshipers can live life to the fullest here. The weather is beautiful almost all year round. This makes these islands also a very loved winter sun destination. Spain has a lot of beautiful nature, the diversity is big. There are nice mountains, national parks, the beautiful beaches and even ski areas in the Pyrenees and the Sierra Nevada. At the foot of the many mountain ranges a lot of different landscapes can be found, like the green pastures in the north, the desert like areas in the south west, the olive and apple tree orchards of Andalusia in the south, the palm forests on the east coast and the many rock coasts. You will be amazed by the variation in the landscape, no region is the same. Spain is covered with remains from cultural heritage that go thousand years back in to history. There are memories of the Romans, you can find perfect medieval castles but also the influence of the Arabic conquest can be admired. A visit to the impressive Moorse Alhambra in Granada is, for example, also very much worth visiting. Nevertheless, the catholic churches demand most attention. Everywhere you will find churches, that are heavily decorated on the in and outside. To get a real look at the heart of Spanish culture, you will definitely have to visit one of the many catholic festivities. Spain knows many pilgrimages of which the most popular one is the cathedral of Santiago de la Compestela, that has been the guide mark for thousands of years for many pilgrims throughout Europe. Spain of today knows many big artists, like Picasso, Dalí, Miro and Gaudí. It won’t surprise you that the offer of cultural sites is very big. There are many exclusive art museums like the Prado in Madrid, the Guggenheim in Bilbao and the Dalí museum in Figueras, near Barcelona. In addition to that flamenco is of course also typically Spanish. Visit a flamenco performance and let yourself been taken away with sometimes Arabian like sounds. Flamenco finds its origin in the southern provinces of Spain. They play guitar, sing and clap with their hands. The dancing consists mostly of stamping with the feet, the gracious turning of the hands and the ladies sweeping with their beautiful dresses. The movements are very expressive and smooth, you will see powerful grace. You are ensured of a beautiful Spanish evening. Perhaps you would like to lie on the beach and let yourself bronze in the Spanish sun or perhaps you would prefer to wander through a beautiful city or picturesque town. But there is so much more possible. You can make bicycle or walking trips, you will most definitely enjoy the beautiful nature. Spain is also good for mountain climbing. In the most mountain areas there are beautiful routes set out and thanks to the mild climate you can climb from early spring till late autumn. And what did you think of a jeep safari, driving with a quad, gliding, bungee jumping, snorkelling, jet skiing and even just normal skiing and snowboarding, just to name a few things? You won’t have to bored for a single moment. The Spanish kitchen is actually as diverse as the land itself. Every region knows its own specialties. But of course there are also delicacies that people can enjoy in the entire country. Typical Spanish food is, for example, the chorizo sausage and the jamon serrano. Gazpacho, a cold tomato soup, and paella are eaten everywhere, just like tortilla’s, calamaris (fried squid rings) and tapas. Every region knows its own varieties of these dishes. And did you know that Spain is one of the most important wine producers in the world? In the summer sangria is often made from the wine by adding fruit and liquor. Sherry is also typically Spanish, it originates from the Andalusia city Jerez de la Frontera. Of course you would also like to buy a souvenir as a nice reminder for yourself or a nice present for family or friends. Tourists, arts and pottery go hand in hand in Spain. Galleries with paintings, ceramics or pictures can be found in many touristic places. You can choose from numerous pots, bowls and vases, or you can look for a beautiful tile with your house number. Leather clothes, bags and shoes are very affordable. Other recommendations are specialty shops in the cities with, for example, fans, hats or tailor-made clothing. In the cities you can also find many trendy shops. Another excellent tip: a visit to one of the many buzzing food markets. Restaurants and cafes are there in abundance in Spain. That is why cafés are without a doubt the meeting places. For many people it is like a second living room. On the coast and in the cities you can find many clubs and bars. Would you prefer a more traditional setting than you can go to a flamenco show. And when you want to feel like a real Spaniard, you will have to parade on the local plaza or ramblas at night. In the best Spanish tradition: you should be there from ten onwards, in your nicest casual clothing and with your entire family. It is wonderful to adjust to the Spanish times. A nice quiet moment during the siesta, which is generally from 14:00 till 17:00 hours. Shops are closed then, but everything opens again at night. A nice holiday rhythm. Are you starting to look forward to a wonderful holiday in Spain? What do you think of spending it in your own villa? Club Villamar offers you holiday homes fitted with all modern conveniences, often with a private swimming pool. The ideal base to discover Spain. You are in one of the many destinations in a minute with a cheap airline or perhaps you can go with your own car, that is also an option. Book now your dream villa online. Use the orange button on this page for more information about your dream villa! Search for your villa in Spain! Lovely villa with private pool at walking distance from Lloret de Mar, the beach and supermarket! Villa with beautifull sea view in Tossa de Mar, with a private swimming pool and in a walking distance from the beach.